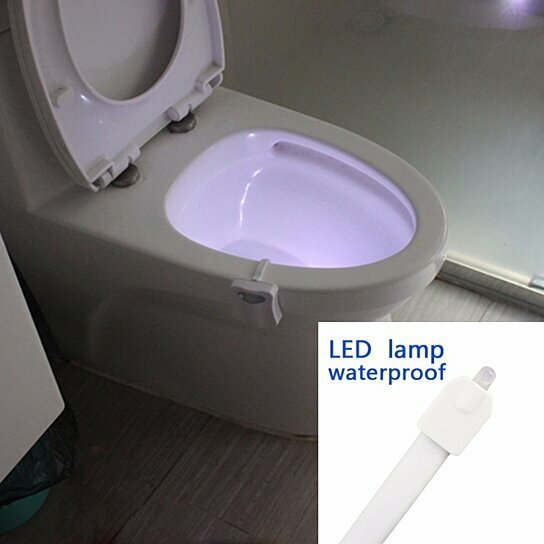 Special toilet nightlight equipped with Auto-sensing system, turns on when you approach the toilet in dark, and turns off after you leave, convenient and energy saving. Personalized modes with 8 different colors. Choose color-rotate and single-color as you wish. Each color for 15 seconds randomly and 120seconds overall for a circle, you can also fix one color you desire. Emitting soft light in order not to disturb others in the night, more comfortable for your eyes. Lead your way safely and softly in the night. With flexible rods, freely adjust it to suit the size of your toilet. Your lightbowl will work best if you the sensor is facing the Door. Do not look directly into the LED light's inside the base. They are very bright and may casuse damage to one's vision.